Patrick Lencioni is a best-selling author of several books on management and leadership. I remember reading Five Dysfunctions of a Team and The Three Signs of a Miserable Job and truly enjoying the parable-style writing of Lencioni. Those books inspired today's blog post, written Lencioni-style. This is a story about Mike, a new high school basketball coach. Mike’s history as a basketball player makes him seem like the perfect candidate to be a successful coach, since he was an all-star player at his high school and now had returned “home” to take on a struggling team. You see, Mike really enjoyed playing basketball. He did everything he was told to do, at practice and even on his own by attending camps in the summer and off-season. Mike was now ready to put his experience and ideas into practice by, in his words, teach his athletes the game of basketball as well as some lessons they could use in life. Mike only had 5 players on his team. He had enough to put a team on the court, and he told himself he would have time to build the program and get more players to join the program in the future. He met the players before the season and thought they all seemed like great kids - respectful, attentive, and polite. He was eager to start the season. As October approached and it was nearing the time for the first practice, Mike reminded himself of some of the drills he had to do as a player, and he also looked through a book of practice drills written by J.W., a successful high school and college coach. He felt like he had enough for the players to do for an entire practice, so he felt ready when the first day arrived. Coach Mike spent the first 30 minutes or so showing the players the drills. Thanks to his morning pick-up games before school at the local church gym, he was still in good shape and his skills were still sharp. Mike went through each drill, demonstrating the skills for the players and then allowing volunteers to try them a few times. He made sure to ask the team if they had any questions about the drill before they were going to do it on their own. With only an hour left of court time, Mike knew that his players needed to practice. 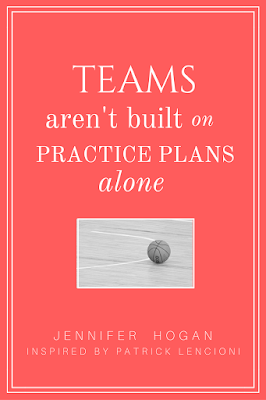 He trusted his players to give good effort, so he left a list of the drills for them to do on their own while he worked on some other things in his office that he needed to get completed. The practice routine continued until the first game. With only 5 players, everyone would get to play every game. At the first game, Coach Mike was surprised at the outcome. His team had lost by a large margin. He had seen some good things from some of his players, but there were other things he had seen that were not executed well. He realized that almost if not all of his players were not rebounding strongly. He understood that he didn’t provide enough opportunities for them to practice that skill. He found fault in himself with that one. As for the other skills, he blamed the players. “They’ve had opportunity after opportunity to practice the skills and get better. I’ve written good practice plans. They must not be trying hard, or maybe they’re skipping some of the harder drills intentionally,” thought Mike. He demonstrated more at practice. He really wanted his players to see what the skills looked like when done correctly. Coach Mike wasn’t sure what to do about his players’ not reacting to different game situations that required them to use their skills at certain times. For instance, when he showed them how to anticipate a pass in practice and had a few players to try it while he was there, they did fine. They knew the skill itself. During the game, the players didn’t know when to use the skills they had learned at practice. Was there something Coach Mike could do differently at practice to help them perform better in the game? What advice would you give at this point? How does this story compare to classrooms?